Copyright: The Organiser acknowledges that You, the Entrant, retain full ownership of the copyright in each Entry. All Entrants agree that any Entry submitted to the competition may be used by the Organiser, and its Event Partners (Wacom, Canson, Momento and Datacolor) for the purposes of judging the Competition, and marketing and promotional purposes of the Competition. Who can enter: Open to all non-professional photographers. There are also six Category Prizes and the winner of each category will win a Canson Discovery Pack Fine Art Photo, a Datacolor Spyder5, a Momento photo book voucher, and a Wacom Intuos tablet. Announcement of winners is on 15 September 2017. 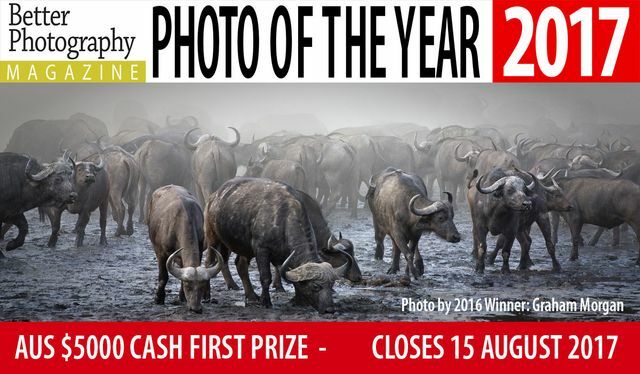 There is one free entry for every four paid entries – so enter four images and you receive a fifth entry free. Up to twenty images can be entered. Image requirements: sRGB colour space, 8-bit; 2300 pixels on the longest side; JPEG at a setting of 8 (80%) or higher; Winning Entrants must also be able to provide a high resolution digital file suitable for offset printing if required.